I don’t travel to Fullerton much, but whenever I do, This is no difI find that the majority of places I end up trying are all pretty much solid and worthy of mentioning. ferent with D’Vine, a Mediterranean restaurant and bar, located in the downtown SoCo (south of Commonwealth) area of Fullerton. The restaurant consists of a nice-sized patio, a bar area with dining tables, as well as additional rooms for events and large groups. There are two locations — Brea which opened in 2012, and Fullerton in July last year — both offering lunch and dinner, as well as libations and entertainment selections. While perusing the menu, a basket of warm pita chips and condiments of olive oil and za’atar is dropped off for us to munch on. We decide to start with D’Vine Mezza ($15) which allows us to sample various appetizers on a platter. 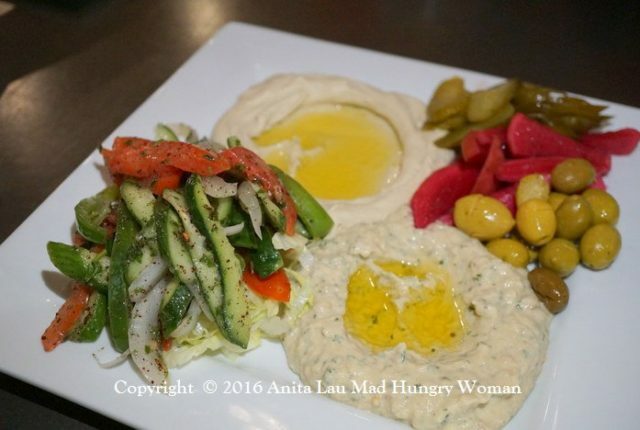 Hummus; baba ghanoush, Mediterranean salad (sliced cucumbers, bell peppers, tomatoes, onions, parsley, lettuce, with lemon juice, house spices and olive oil; and turshi (pickled vegetables) are all available a la carte, but this way, you get a little of everything to taste. We loved everything, especially the smoky and robust mashed eggplant of the baba ghanoush. Those on a gluten-free diet will be happy to know that much of the menu is GLUTEN FREE! Everything is super fresh and how I’d imagine dining at a friend’s home is. D’Vine is definitely one of the top three places for a stellar Mediterranean meal in Orange County.